Someone once said that every artist is merely a product of their influences. It’s never been clear exactly just who made that assertion, but chances are that if they hung out with the guys from Skindred, they’d be forced to conclude that these four Brits must have a pretty awesome record collection. How else to explain one band having at once the bare-knuckled fury of Black Flag, the urgency of The Clash, the punk-reggae stylings of Bad Brains and the raw down-tuned riffage of Pantera? In the hands of lesser practitioners this would be a recipe for disaster, but Skindred have the advantage of knowing how not to just incorporate the best of these bands into their sound, but how to switch seamlessly between them. Dancehall rhythms, dub percussion, ragga harmonies, metal riffs, funk bass, thrash drumming, death vox – just the thought of merging all these at once should be enough to exhaust a listener. That Skindred actually manages to (mostly) pull it off is not just commendable – that would be dismissive – but also makes for a pretty compelling record. After a while you realize that what they also learned from all those forefathers is that it is possible to both entertain and invigorate the audience at the same time, be it through brutal instrumentation or catchy-as-all-hell vocal hooks. 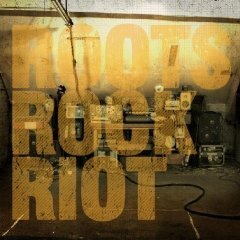 With lyrics delivered like battle cries, Roots Rock Riot is less a continuation of the band’s ragga-metal experiment than it is a call to arms, each track less a song than another entry in the Skindredfesto, in which the group rails against the banality of modern music, the grind of daily life and the suffocation of conformity. Does this sound familiar? It should, but by reaching outside the typical genre fusions that so many other less adventurous bands have adopted, it doesn’t. Take every Peter Tosh song, tune it down to B and play it at double-time. Get the idea? Maybe not, and sometimes you wonder if the band does, either. While the novelty of the punk/metal/ska/reggae fusion and the occasional schizophrenia of the songs might quickly wear thin for some, those tough enough to go along with it have a pretty sweet reward waiting for them at the end of the Riot. So can Skindred be called a product of their influences? No, not really; more like a sum. Strictly speaking, products are the result of multiplication and Skindred’s sound is clearly the result of simple addition, albeit a remarkably complicated one. Roots Rock Riot doesn’t entirely deliver on the band’s promise, although it very strongly hints that the band is capable of making not just immediate music but also lasting music, and that may be the greatest lesson that awesome record collection ever taught them.